The Senior Residence at St. Peter the Apostle is a small, close-knit community for independent seniors who wish to live in a family like atmosphere. Located on the campus of St. Peter the Apostle Church in River Edge, NJ, the residence opened in 2013 and is home to 23 seniors. The Senior Residence is warm and welcoming with its family dining room, community gathering spaces and homey décor. The non-denominational residence provides seniors with everything they need to live a full and active life at more affordable rates than other housing options. Residents can choose to spend their days exercising, strolling at nearby Van Saun County Park, volunteering at the local church or at the adjacent grammar school, curling up with one of the many books in our library, or simply enjoying the company of others on the sun porch or deck. The Senior Residence also features a therapeutic garden where residents can plant flowers or simply relax. 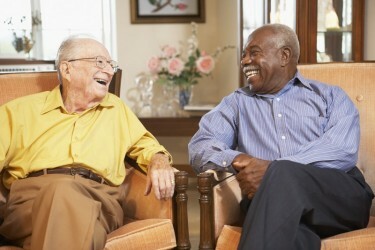 While The Senior Residence has 24 hour professional staff, we have worked to create a family and home-like community. With three home cooked meals provided daily, residents also have the opportunity to participate in preparing their favorite meals together and sharing them in our communal dining room. We gather regularly in the living room to watch movies or cheer on our favorite sports teams, and just like any other family home we enjoy playing cards, discussing current events and sharing stories. The Senior Residence is located in peaceful River Edge with its close proximity to beautiful parks, accessible transportation and nearby shopping. Adjacent to the residence is Van Saun Park, a 146-acre Bergen County park with walking trails and bike paths meandering through the grounds. Van Saun Park has a number of attractions including a carousel, the nationally accredited Bergen County Zoological Park as well as the historic Washington Spring Garden. The borough has a number of bus lines running along River Edge’s main corridors that provide access to local banks, pharmacies, eateries and retail stores. River Edge also offers a free senior bus throughout the week to many of the town’s most popular spots. River Edge’s two train stations are located on the Pascack Valley Line providing easy access to Hoboken and New York City. Bergen County has five major shopping centers, including the state’s largest and closest in proximity- the Garden State Plaza.